Primary bone cancer originates in the bone tissue and spreads quickly to other parts of the body. It is more commonly associated with youths (aged 10-20) and covers approximately six per cent of childhood cancers. The following piece will outline and highlight the signs and symptoms of juvenile bone cancer. Osteosarcoma involves a cluster of malignant cell tumours producing immature bone. The cancer breeds where new bone is supposed to form or at the ends of bones and is typically found in the arms, knees and legs, but it can be detected anywhere really. Your child will feel bone pain, or experience swelling or lumps around the joints which hinder proper movement. Weakened bones may lead to simple fractures or breaks and they may not recover from simple falls or injuries as quick as other children. They may feel feverish or experience insomnia or weight-loss. These are some of the signs and symptoms of juvenile bone cancer, or osteosarcoma in particular. Ewing Sarcoma originates from red bone marrow and is especially synonymous with youths aged 4-15. 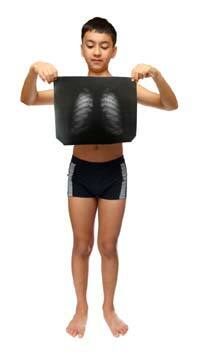 It is the second most frequent malignant juvenile bone cancer and is the most dangerous. It may not become apparent until the early teenage years and typical symptoms include pain at the site of the cancer, which may be noticeable as a lump or swelling. It affects the pelvis, upper arms and legs, shoulder blades and ribs. Differentiated Adamantinona is a bone cancer that typically affects juveniles under the age of 20. Classic Adamantinona in seen more in patients over 20. Both cases are very different radiographically and histologically. Adamantinoma is a rare enough type of juvenile cancer however; only 200 cases have been discovered since 1913. It tends to stay in the tissue where it originated (usually the shin-bone or jaw), but it can spread. Patients suffering from this form of bone cancer have complained of pain and swelling in the area of the cancer, and are inhibited when they move certain body parts. So when it comes to the signs and symptoms of different forms of juvenile bone cancer, most of the symptoms are the same. Bone pain and swelling in the area of the tumour and a limp or an inability to perform routine tasks because the joints are affected. However, most tumours found in the bones are not malignant and not life-threatening and can be cured by going to the doctor who will arrange for a biopsy to ascertain what exactly the problem is and what can be done to cure it; there are many effective ways for the treatment of juvenile bone cancer.